Have you started yet?? Christmas Shopping?? I am super late starting this year. I like to start thinking about my lists in September, then actively shopping in October. My goal during this season is to be finished with my shopping by Thanksgiving. It makes December relaxing and fun. I don't have to worry about going to the stores unless I want to. I can decorate, bake, wrap and enjoy the days leading up until Christmas! This year though, I didn't start thinking about it until November. I am still really hoping to finish by December 1st! Think it will happen?? I thought over the next few weeks I would share what I think would be great gifts for kids in my kids age range! I know that it gets more difficult as they get older and I always love to hear other ideas! Today I am going to highlight girls between 10-12. 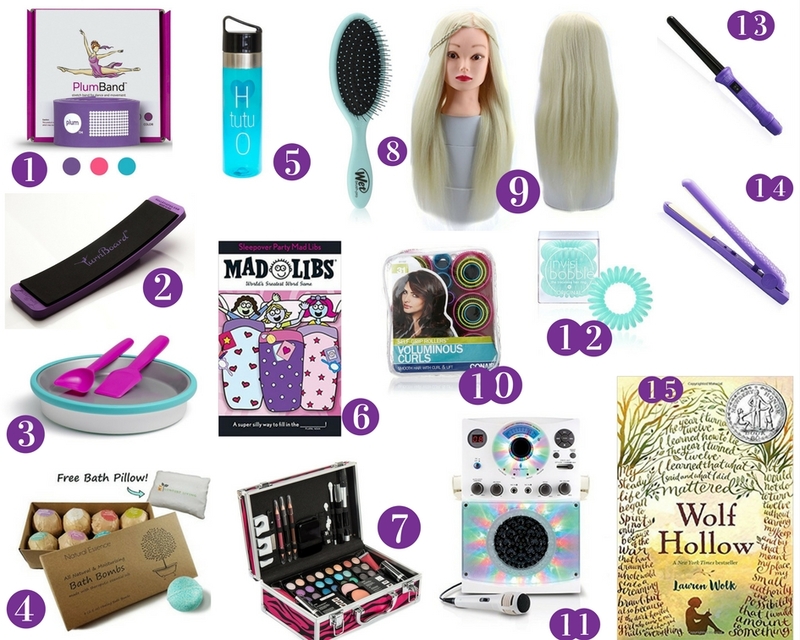 I hope you get some ideas for those sometimes hard to buy for tweens! 1. The Plum Band Stretch Band - This band is perfect if you have a dancer in your life! Olivia uses this all the time to help her stretch and she has been able to perfect a full split! 2. TurnBoard - the turnboard is used all the time in my house to help with balance and to work on turns. It is small and takes up hardly any space, but has a big impact on her practice! 3. Chef'n Sweet Spot Instant Ice Cream Maker - this popped up in my ads one day and I thought what a perfect gift for an ice cream lover! I don't know if there is a girl out there that doesn't love her some ice cream! I love the idea of this because it isn't another small appliance, it works with the cold stone. It makes a nice personal size amount of ice cream and you can add things to it to make it a little more fun! 4. Natural Essence Bath Bombs - Who doesn't love fun bath stuff? I know I do and my 11 year old loves to take a warm bath at night! I liked this set because it offered a free bath pillow! 5. Covet Dance H tutu O water bottle - again with the dance presents! This water bottle would be a perfect small present for someone filled with something small like candy/gum! 6. Mad Libs Sleepover Party - do you remember Mad Libs? Tweens love a good sleepover and what is more fun at a sleepover than making up super funny stories and giggling into the night?? 7. Vokai 79 Piece Makeup Kit Gift Set - A lot of tween girls are starting to experiment with makeup. This is the perfect way to give them everything they need to try! 8. Wet Brush - we love a wet brush in our house and you can never have enough! Bathrooms, bedrooms, dance bags, lockers, etc. and who doesn't love a fun pattern on a brush?? 9. Luxwig Mannequin Head - How cool would this be for a girl experimenting and learning how to do hair? I know my girl needs a lot of help in the learning to do her own hair department so this would be a perfect present for her. It is real hair so you can use heat on it, they can style with a straightener and curling iron, wash it and cut it! Don't forget to get the clamp to make it stay in place! Click here for the mannequin and here for the clamp. 10. Conair Self Grip Rollers - These are fun for the mannequin or on themselves. No heat needed for these! 11. Singing Machine - this was under our tree last year and it still gets used! Love a gift that lasts! It can work as just a bluetooth speaker or you can plug in the microphones and sing along! The multi flashing lights make it look really cool as well! It comes with only one microphone, but you can get another one here. We often like to "sing" together so we have liked having two! 13. HerStyler Curling Iron - this is perfect for experimenting with the mannequin or themselves! 14. HerStyler Ceramic Straightener - again perfect for playing with the mannequin or trying on themselves! I know my girl loves when her hair is straightened and smooth! 15. Books - in our house books are always a great gift. Wolf Hollow is a book that Olivia could not put down recently! It is now on my table because she said I would love it too! I hope everyone has a great Thanksgiving and is able to spend time with friends and family! I am so incredibly excited to be hosting at my home this year with some extra special family! But as soon as Friday arrives it is Christmas season in my house! We are already listening to Christmas music, but on Saturday we go cut down our tree and decorate the house! Then I have one week left to shop to reach my goal! We shall see!